(defend your windows and doors) Easy to install on every type of door or window The magnet goes on the door or window, and the sensor goes on the frame (or vice versa). 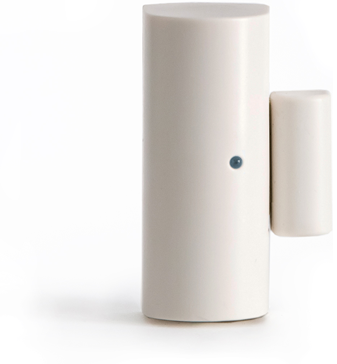 Magnet can be placed up to 2 inches from the sensor, so sensors fit on all types of doors and windows. SimpliSafe sensors come with the battery pre-installed and adhesive tape pre-applied, making installation a snap. Door Chime When your system is OFF and a door or window opens, the Base Station will sound a door-chime so you’ll know if someone is entering. How does it work? The sensor detects whenever the magnet moves more than two inches away from it- so it knows whenever the door or window opens.